The 7th Annual Okuyamba Fest took place July 31 – a little earlier than usual – and featured special guests from the Palliative Care Association of Uganda (PCAU). Country Director Rose Kiwanuka, Programmes Manager Mark Mwesiga, and Information & Communication Technology and Data Quality Officer Cynthia Kabagambe joined us at this year’s Okuyamba Fest. Guests were welcomed into the event by the sound of live African drums. The theme of the evening was a celebration of 10 years of fruitful partnership between Center for Hospice Care (CHC), the Hospice Foundation and PCAU. 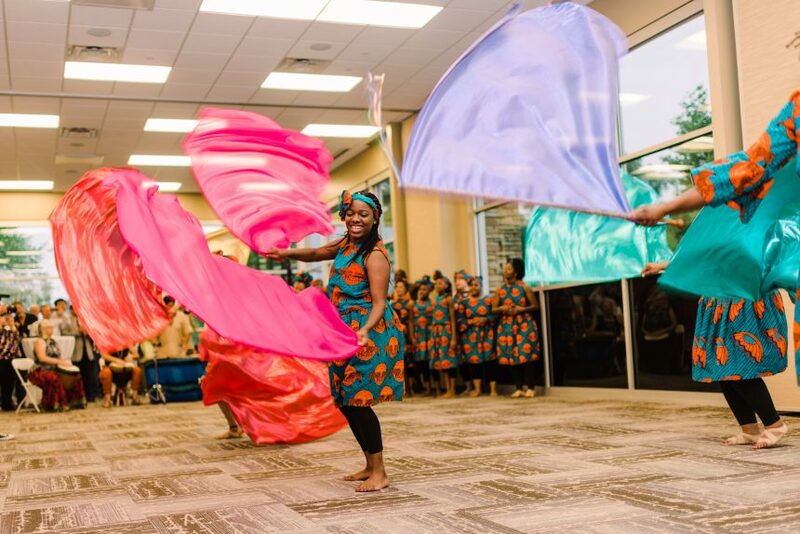 The event, held at CHC’s Mishawaka campus, also included authentic African cuisine provided by a local chef, as well as a stunning performance by the dance troupe Uzima. The more than 175 people in attendance experienced an event they will not soon forget. Center for Hospice Care (CHC) and the Hospice Foundation (HF) have had a partnership with PCAU through Global Partners in Care. From the beginning, the union among the organizations has been beneficial, allowing everyone involved to share best practices on improving access to hospice and palliative care in low-resource countries. This event was also a fundraiser for PCAU and specifically for the Road to Hope Program that provides support to orphaned Ugandan child caregivers who were the primary caregivers for their dying parents or guardians. To help make the fundraiser more efficient, the Hospice Foundation worked with GiveGrove, a local company specializing in online auctions. In addition to a successful auction, two children were sponsored in the Road to Hope program. For more information on our partnership with PCAU, please contact HF’s International Programs Coordinator Denis Kidde at 574.277.4860 or KiddeD@cfhcare.org.